I turned on my sewing machine and it sounds like it is running or has a humming sound. Check to see if you bobbin winder is on. This should fix the problem. And if that doesn’t work, open your machine up to see if there might be a small humming bird caught inside. Set it free and the sound should be gone. I dropped my feed dogs and now they wonâ€™t come back up. After dropping the feed dogs you must sew a stitch or rotate the handwheel one full rotation for the feed dogs to come back up. When they come back up, give them a treat and tell them they’re good dogs. I washed my project and the color bled. A: We sell a product called Synthropal that will pull the bled color out of fabrics. A: We sell a product called Retayne. You only have to use a capful for a wash load and it will help your colors to stay put! A+: Before washing vibrant colors, put the piece in cold water and a mixture of ¼ cup table salt and 1 cup distilled vinegar. Let it soak for a minimum of 4 hours. Wash seperately in cold water and a detergent without bleach boosters. My machine keeps skipping stitches and breaking thread. Try changing your needle, re-threading your machine both top and bottom, cleaning out your bobbin, and oiling your machine. Also try a different spool of thread. Does it sing while it’s skipping? I heard all machines are plastic on the inside. Is that true? All working parts of the machine are metal. There are some nylon gears for sound purpose. Very sturdy indeed! Can I use an embroidery needle to sew? You can use one but to get the best quality stitch you’ll want to use an actual sewing needle. Either sharp needles for woven fabrics or ball points for stretch fabrics. My Brother Manual says NOT to oil my machine. My Customer Course teacher says YES oil your machine. So, to oil or not to oil, that is the question. Yes, you should oil your machine. As for the frequency of oiling… every 8 hours of sewing is recommended. And as for the places... Oil in the channel underneath your bobbin case and between the two dark black bearings. Oil is not like asprins . . . if one is good two is better. ONE drop only. Over oiling is worse for your machine than lack of oil. My top thread is making loops on the bottom. Help! Try these fixes… Rethread your machine, making sure the presser foot is up, change your needle, check the type of needle you are using (is it the correct needle for what you’re sewing? ), clean out the lint from your machine, check the tensions. If you have a Free Hand System (kneelift) make sure you are not leaning against it as you sew, releasing the top tension. If none of these fix the problem, give us a call. What are sharp needles for? Woven fabrics. And swords for hamsters that dress up as knights. What are ball point needles for? What other types of needles are there? After going through about 3-4 full bobbins of thread. Which way does the needle go into my machine? The flat side of the needle should be to the back of the machine. How often do I need to service my machine? It depends on how much you are sewing! You should service your machine at least once a year. This will keep your machine happy, healthy, and lasting a long time for you. My fabric just sews in place and wonâ€™t move. Make sure you’ve raised the feed dogs and then take a stitch to fully engage the feed dogs. Woof! I signed up for your Newsletter and I received emails for a while but then they stopped. Why? We promise we didn't remove you from our list! When your computer installs updates, sometimes it alters the way your email spam filters work. So, our emails might be getting put into your junk box or might not be getting to you at all any more. We suggest that you frequently check our website and facebook. We will be putting everything from our emails onto our website so you're sure to see it all!! 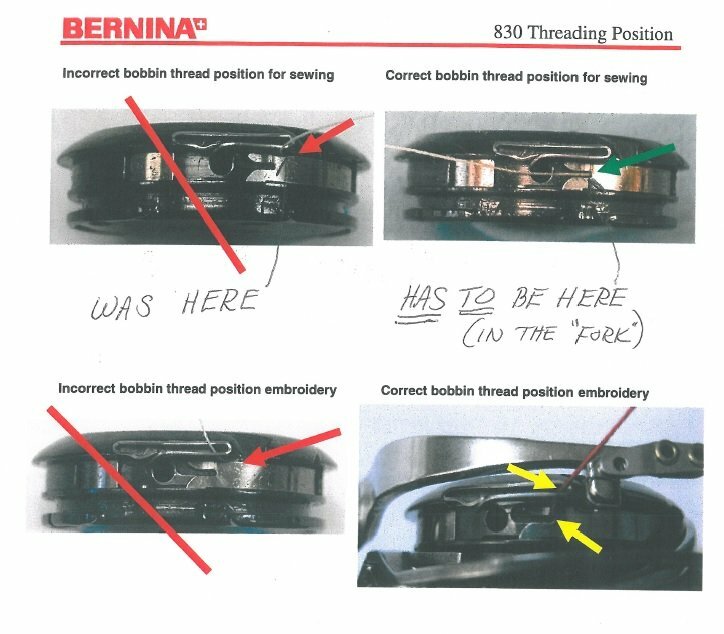 How do I thread the bobbin on my BERNINA 8 Series Machine? What's the difference between pressing and ironing? When you press, you move the iron across the fabric by lifting it up and putting it back down in an overlapping pattern. When you iron, you slide the iron across the fabric with a back-and-forth motion. Ironing may stretch or distort the fabric, pressing won't.